The morning after Halloween was so chilly. I woke up with my blankets wrapped tight around me and my fat cats cuddled by my side. I love these cozy weekend mornings. When the weather is like this, nothing is better than a rich bowl of soup. 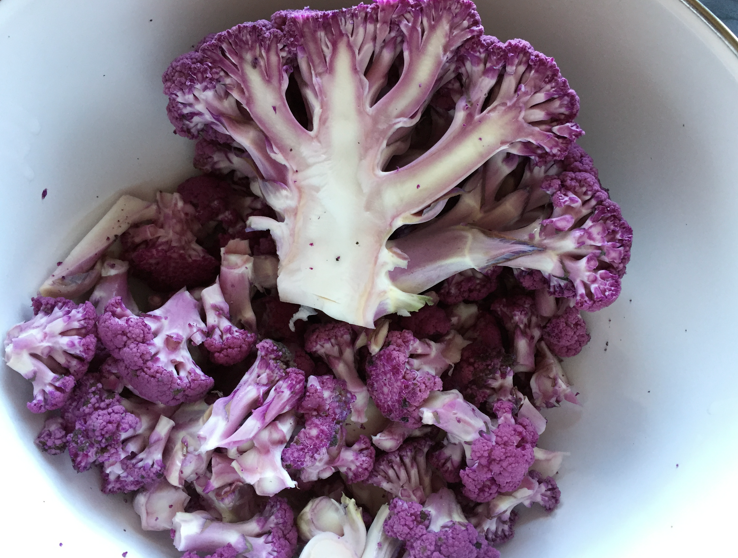 I dug around my fridge and found a purple cauliflower. I purchased it with the intent of roasting it with sweet potatoes (seriously, an amazing pairing) but cauliflower soup sounded so good. 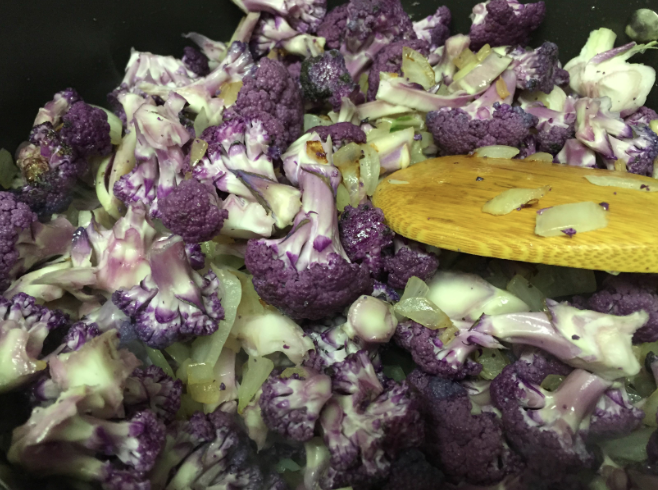 Have you ever had purple cauliflower? It tastes like candy. Just kidding, it tastes like normal cauliflower. It is slightly sweeter but otherwise, the same. If it is available, I prefer it over the colors since it is the prettiest. The striking color comes from anthocyanins, molecules that gives the purple, blue, red colors in plants. It is also a powerful antioxidant with anti-cancer properties and cardiovascular protective abilities (Lila. J Biomed Biotech. 2004;5:306-313). Well, if that doesn't make you want to eat more purple/red colored things, I don't know what will. Except...maybe this soup. 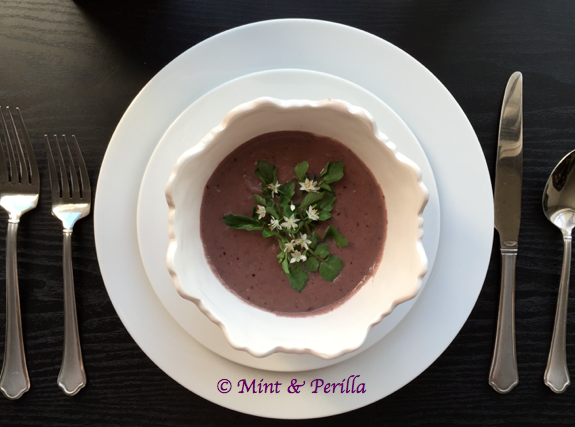 Cauliflower soup is luxurious like potato soup but has less carbohydrates. And you know what else? It's super easy to make. 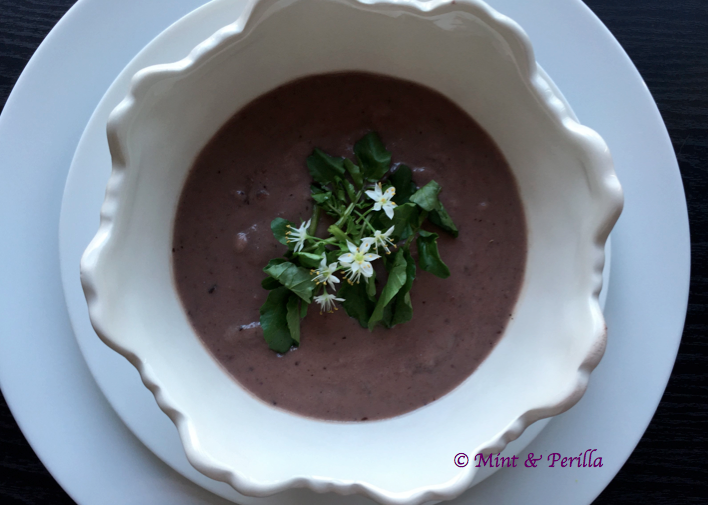 If you have a blender (even if you don't), and basic knife skills, you too can make this cozy and delicious soup. 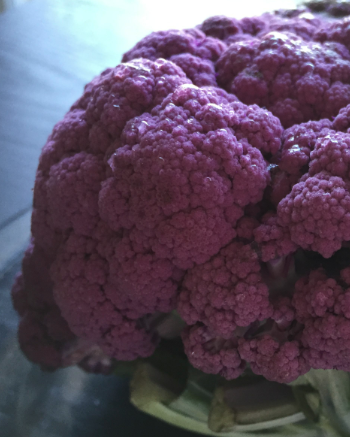 Your cauliflower doesn't have to be purple for you to reap its health benefits. Cauliflower of all colors is high in vitamins C, folate and fiber and low in carbohydrates. 1. Wash cauliflower. Cut up cauliflower. I break up the florets into small pieces and cut the stems into slices. I save the tiny leaves around the base of the stem to top my salads. They are so tender and sweet. 2. 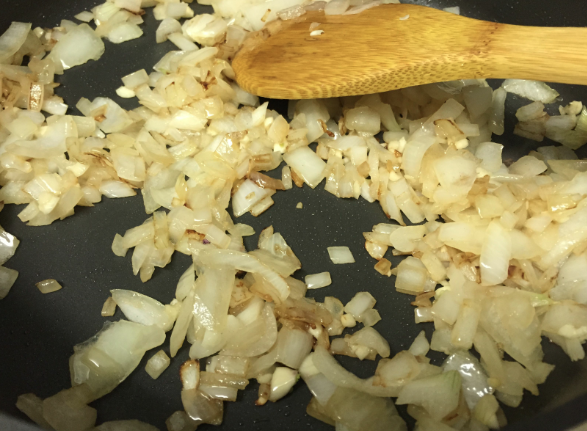 Chop onions and garlic (and celery and carrots if you wanted to add them). 4. Stir in cauliflower florets. Pour in the chicken (or veggie stock) and cover with lid to simmer. 5. While the cauliflower is softening, make the roux for your soup. To do this, melt 2 Tbsp butter in a small sauce pan. Whisk milk and flour in a mixing cup. Pour your milk mixture into the melted butter and whisk vigorously. The mixture should thicken to make a white sauce. 6. Add the white sauce/roux to your cauliflower stock mix. Stir and bring the mixture to a simmer for ~5 minutes. Season with a touch of salt. 7. Take it off the heat and let it cool for a few minutes. Then add the mixture to a blender (or use an immersion blender or food processor...but be careful to not burn yourself). Blend until you achieve the consistency you want. 8. Serve with something green to make it pretty. I like watercress but parsley and chive are also nice. The white flowers are chive blossoms. They are totally edible (and pack a serious garlicky punch).